Bronco has recently released an interesting set of accessories to go along with one of their more recent kit releases. 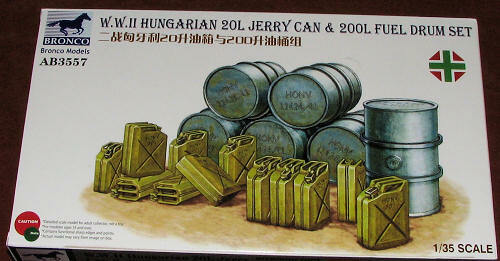 This is a set of Hungarian Jerry Cans and Fuel Drums. The cans are 20 liter while the drums are 200 liter. These are slightly different that those items produced by the Germans and have different embossings on them. 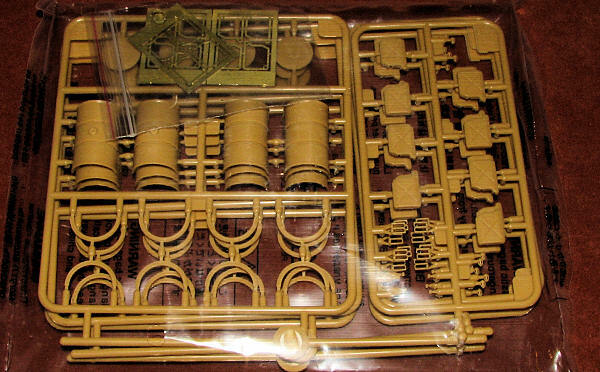 The kit is molded in tan plastic with photo etch. The photo etch is used to simulate the central seam on the Jerry Cans and is trapped between the can halves. There are an even dozen of these cans. The fuel drums are in halves with the exterior reinforcement ribs and the can upper and lower 'lid' being separate items. There are six of these fuel drums in the set. Instructions and painting information is printed on the back of the box with several different paint brands being offered.